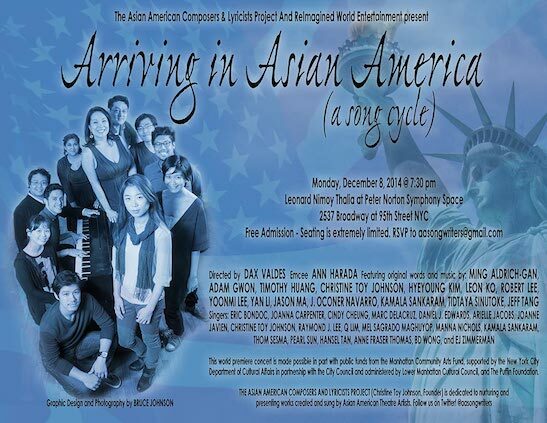 The Asian American Composers and Lyricists Project and ReImagined World Entertainment will present “Arriving In Asian America,” a song cycle collectively written by members of the project with original words and music by Adam Gwon, Timothy Huang, Christine Toy Johnson, Ming Aldrich-Gan, Hyeyoung Kim (with Michael Cooper), Leon Ko, Robert Lee, Yoonmi Lee (with Gaby Gold & Zhu Yi), Yan Li, Jason Ma, J. Oconer Navarro, Kamala Sankaram, Tidtaya Sinutoke (with Ty Defoe) and Jeff Tang. Directed by Dax Valdes, the one night only performance will take place on Monday, December 8, 2014 at 7:30 pm, at Peter Norton Symphony Space’s Leonard Nimoy Thalia, 2537 Broadway (at 95 St.). Emceed by Ann Harada (“Cinderella”), singers will include Raymond J. Lee (Honeymoon in Vegas), Pearl Sun (If/Then), Marc delaCruz (If/Then), Thom Sesma (The Times They Are A-Changin’), Man of La Mancha, Nick and Nora, Arielle Jacobs, Hansel Tan, Manna Nichols, Eric Bondoc, Anne Fraser Thomas, Joanna Carpenter, Joanne Javien, EJ Zimmerman, Cindy Cheung, Daniel J. Edwards, GyuJin Lim, Kamala Sankaram, Mel Sagrado Maghuyop, and Christine Toy Johnson. 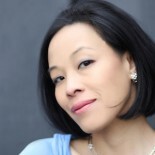 Ann Harada can be seen in Cinderella on Broadway through December 14, 2014. Lia Chang is an actor, a performance and fine art botanical photographer, and an award-winning multi-platform journalist. Lia starred as Carole Barbara in Lorey Hayes’ Power Play at the 2013 National Black Theatre Festival in Winston-Salem, N.C., with Pauletta Pearson Washington, Roscoe Orman, and made her jazz vocalist debut in Rome Neal’s Banana Puddin’ Jazz “LADY” at the Nuyorican Poets Cafe in New York. She is profiled in Jade Magazine. This entry was posted on November 16, 2014 by Lia Chang in Asian American Artists, Asian American Issues, Chinese American History, Entertainment, Music, New York, Theater and tagged Adam Gwon, Ann Harada, Anne Fraser Thomas, Arielle Jacobs, Arriving In Asian America, Asian American Composers and Lyricists Project, Backstage Pass with Lia Chang, BD Wong, Christine Toy Johnson, Cindy Cheung, Daniel J. Edwards, Dax Valdes, EJ Zimmerman, Eric Bondoc, Gaby Gold, GyuJin Lim, Hansel Tan, Hyeyoung Kim, J. Oconer Navarro, Jason Ma, Jeff Tang, Joanna Carpenter, Joanne Javien, Kamala Sankaram, Leon Ko, Lia Chang, Manna Nichols, Marc Delacruz, Mel Sagrado Maghuyop, Michael Cooper, Ming Aldrich-Gan, Pearl Sun, Raymond J Lee, ReImagined World Entertainment, robert lee, Symphony Space, The Asian American Composers and Lyricists Project, Thom Sesma, Tidtaya Sinutoke, Timothy Huang, Ty Defoe, Yan Li, Yoonmi Lee, Zhu Yi.